Freezing weather outdoors ... cozy and warm inside your home. For many folks, that's a picture of the ideal winter conditions. Cranking up the furnace is one possible way to get that comfort you crave, but the cost, in terms of environmental impact and astronomical energy expense, is out of the question. There are plenty of simple ways, though, that you can stay pleasantly warm indoors while still being energy- and pennywise. Weatherproof your garage doors. If your garage serves as anything besides just a place to park your car -- crafts room, office, or just general man cave/hangout, for example -- you'll definitely be looking for ways to stay warm. 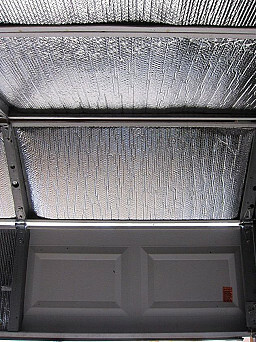 However even if all you use it for is its intended purpose, it's important to keep frigid air out of an attached garage. Otherwise the cold will get into the adjacent room and chill your home. Insulate and weatherstrip garage doors. Seal cracks around any windows. Schedule regular changes for your furnace filter. Change your furnace filter once a month or according to the manufacturer's instructions. A clean, dust-free filter will help your furnace to perform most efficiently, keeping you warm without causing your fuel bills to skyrocket. Make vents more efficient. Be sure that your heating system's air vents are not clogged with dirt or blocked by large pieces of furniture. You want that warmed air to circulate as efficiently as possible. Minimize heat transfer through your windows. Windows can be a "hot spot" (so to speak) for home heat loss, as a major source of heat transfer. In addition to caulking and weatherstripping around them, consider replacing the panes with an energy-efficient version. Or try a simple and inexpensive fix: hang thermal curtains. These are designed to look like regular decorative draperies, but they are lined with insulating high-density foam. Make sure the ones you buy are also equipped with a reflective vapor barrier to prevent moisture build-up due to condensation on your windowpanes. Close them against the cold night air, but open them in the morning to let the warming sunshine in. Keep cold attic air out of the rest of your home. Your pull-down attic staircase and access cover may be a major source of cold drafts. Once again, weatherstripping is your first course of action. After that, put up a readymade insulating attic access cover. (Now, wasn't that easy?) For optimal energy use, insulate the entire attic space. Say "no" to cold-weather humidity. Cold winter air often tends to be dry as well. Maintaining relative humidity levels of 35 to 50 percent will help you feel comfortable without cranking up the thermostat. Add humidity to the atmosphere by purchasing a humidifier or the good old fashioned way -- by cooking up some hearty long-simmered wintry soups and stews on a regular basis. Mind the gaps. Outdoor electric outlets and switches, as well as those on exterior walls inside your home are often responsible for tiny gaps that let in large amounts of cold breezes. There are several ways to insulate these. Outlets can be simply plugged up with a baby-safe electrical outlet cover. If you want to get a little fancier, remove the regular switch or outlet cover plate and underneath it, install a switch gasket or a foam electrical outlet. Please, please be sure to turn off the electricity before attempting this relatively simple DIY fix. Choose a thermostat that works for you. Programmable thermostats are meant to be a helpful tool for staying warm while spending less on fuel. But that's only if you can understand the owner's manual and actually take the time to program them correctly. For the rest of us, smart home thermostats that "learn" our usual routines or use smartphone data to figure out whether we're at home are heaven sent.